A couple weeks ago we hosted a dinner party for a few friends, bringing together folks from different social circles. It’s fun to figure out just the right group of people to introduce to each other — it’s like playing “Friendship Yenta.” Or something like that. One thing is certain: If the food is good, everyone will get along… and at the very least, it gives us all something to talk about! This party was really Matty’s baby — he chose the people, the date, and the menu. My job was to do the vacuuming and stay the heck out of the way (particularly in the kitchen). He started us off with homemade pickles and 100% whole wheat bread (both were made that afternoon), alongside a cheese platter with Hook’s 10-Year Cheddar and Cypress Grove’s Truffle Tremor (two of my faves — a little of each of these goes a long way). He then offered up spicy carrot with cilantro soup, which we all quickly devoured (including the guest who hates cilantro!). The main course was fennel-roasted wild Alaskan halibut, served on a bed of sauteed fennel. (That’s eight more plates thoroughly cleaned, including another guest who hates fennel!). Finally, dessert: Caramelized figs with a creme fraiche and orange flower water sauce. Divine. I’m going to share each of these recipes over the next few weeks, and although I know you’re dying to know more about the caramelized figs, I’m going to proceed in order. The Renegade Pickle recipe came from Matty’s friend Johnny, who was on an amazing roadtrip — London to Mongolia! — in support of Pencils of Promise. Johnny and his cohorts were traveling under the pseudonym Renegade Pencils, so it seemed only appropriate that this recipe’s name follow suit. 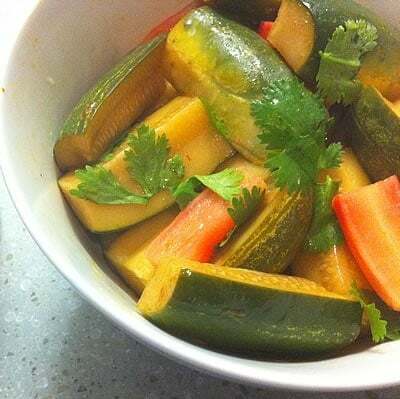 Sweet, but with some unsuspecting heat, these pickled kirby cucumbers and breakfast radishes are definitely renegades as well. Instead of duplicating the recipe here, I’m going to send you over to Matty’s blog, I Make Pickles, where he just shared it. 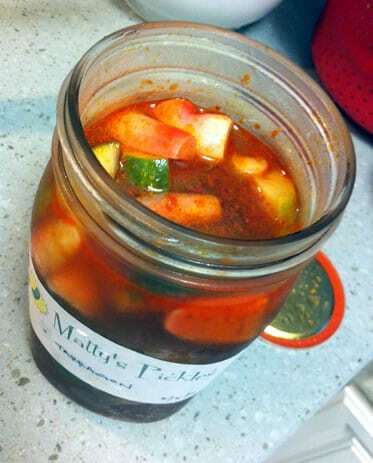 Click through for the recipe, and then read on for some of his other pickling adventures! R,FTW! is short for Recipe For The Weekend! (or Recipe For The Win!, if you prefer). My goal is to find healthy — and delicious — recipes that are easy and fun to make, with an emphasis on healthier substitutions that don’t compromise taste. Wow, Andrew, I can’t wait to make these pickles….